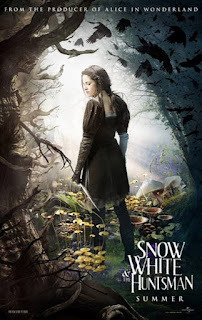 Ingredients: If you liked the visuals of Alice in Wonderland (2010), the dark tone of Snow White: A Tale of Terror, and the decent special effects of Brothers Grimm, you will like this movie. So the first thing you should know about Snow White and the Huntsman is that it is not the Disney-fied story that I’m sure most of us grew up hearing. No, no, this is an adaption of the gritty, in-your-face fairy tale by our good friends, the Brothers Grimm. There will be madness, there will be rage, and, oh yes, there will be blood. The story takes place in a faraway kingdom in a magical land. The queen dies and the king is left grieving her loss until he is tricked into marrying another woman, the evil witch Ravenna (as played by Charlize Theron.) She kills the king, takes over the kingdom, and imprisons the king’s daughter, Snow White (Kristen Stewart.) When Snow White reaches maturity, Ravenna plans on taking her heart making Ravenna eternally young and powerful forever. But before she can enact her plan, Snow White escapes to the Dark Forest -- a horrid place that causes hallucinations in any and all that trek through it. Only one man, the Huntsman (Chris Hemsworth), is capable of navigating the cursed woods and hunting her down. Along the way, friendships are made, wondrous sights are seen and Snow White becomes the leader of an army as she is prophesied to be the only one that can end the evil queen’s rule once and for all. I’m not quite sure what to make of Snow White and the Huntsman, it’s almost a paradox. For every good thing I can mention, there’s something equally bad. There are long sweeping shots of beautiful landscapes and the on location shots are extremely immersive. But then most of the film takes place in a dank, depressing bog. The acting from everyone is spectacular, especially Charlize Theron; some of her best roles are when she’s playing the villain but she really raises the bar for herself in this one. Unfortunately, Kristen Stewart really drags down any scene that focuses on her. Now I know Kristen Stewart is a critics’ favorite punching bag because of some movies she’s previously starred in -- you know which ones! But then again she had quite a bit of potential early on. Kristen Stewart is very good playing a character that has a pretty face, looks confused most the time, and acts mystified by the world around her. And that’s exactly what Snow White needed to be. Of course the problem with this is that when Snow White has to make some big inspirational speech, it is hilariously bad. I found myself liking Snow White and the Huntsman for the most part but I couldn’t figure out why until it dawned on me. So much of what is great in the movie is taken from other films. It’s no surprise that the same producers created the remake for Alice in Wonderland two years prior because all of the whimsical visual effects are almost exact copies of Wonderland. The action scenes are terrific because they are influenced heavily by Lord of the Rings. You can actually draw connections from one character to their counterpart: the Huntsman is Aragorn, William is Legolas, any of the seven dwarves could be Gimli and Snow White is practically Frodo. They’re not even trying to hide it! I think one of the most bizarre rip-off moments was when I realized I was watching a scene right out of Princess Mononoke. Had this been an original story and if they went with a different lead actress, Snow White and the Huntsman could’ve been an epic modern day fairy tale. As it stands now, it’s just an okay flick with some neat ideas. Princess Mononoke? I hear that! That was soo blatant and lazy it didnt even seem an essential part of the film, they just copied that part to create eye candy!! I was just watching that scene in the forest and I had to pause and google if they took that scene straight out of Princess Mononoke! Even the fairies looked like the Kodamas!